Lawmakers and parents argued Wednesday night at a Senate Finance Committee hearing whether a bill before them expanded or regulated a controversial school voucher program. Senate Bill 1395, sponsored by Sen. Sylvia Allen, R-Snowflake, seemingly expands the Empowerment Scholarship Account program in many areas, including allowing students who don’t use the funds to keep them until they are 22 as long as they don’t graduate or get a GED. 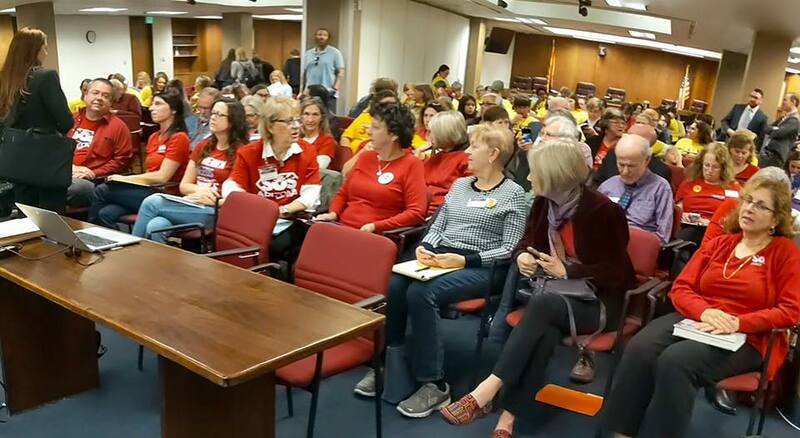 The hearing was packed with people wearing yellow to symbolize their support of the bill, while those in opposition wore red. There were so many speakers registered that the committee’s chairman, Sen. J.D. Mesnard, R-Chandler, limited everyone to 2 minutes. Allen’s measure would allow many more students to qualify for the ESA program. Currently, enrollment in the program is limited. For instance, students that attend a district school that receives a D or F grade from the state are eligible. But SB 1395 would make it so the student merely has to live in the attendance boundary of such a school. Additionally, kindergarten age kids who reside in an area with a D or F rated school can qualify even if they are not attending that school. The bill would also privatize the program and remove oversight from the Department of Education, having it be managed by a third party firm that is chosen by the state treasurer. In November, Arizona voters elected a Democrat to lead the Department of Education for the first time in more than two decades. Proponents and Republican lawmakers argued that the bill was much needed reform to the ESA program and not an expansion. Some of the provisions in the bill add clarity on what can and cannot be purchased with ESA money, Allen told the committee. Many parents who spoke before the committee shared stories of being told that items such as math flash cards are not covered. Many also shared their frustrations with how the program works, and how one year their child with a disability like autism may not qualify for an ESA but the next year they would. The other side argued that the wording was vague enough that it could allow for things that are not needed for education, such as laptops, to be purchased with ESA funds. They also argued that expanding the program would divest more money from public schools, which could handle the needs of children who use ESAs if they had the proper funding. The first person to speak before the committee was Superintendent of Public Instruction Kathy Hoffman, who said the Department of Education is opposition to the bill and is creating an ESA task force that consists of many of the people involved in Allen’s bill, as well as those who oppose it. The aim of the task force is to examine issues within the ESA program to streamline it and make it easier for parents, Hoffman said. She added that Allen’s bill adds “unnecessary layers of bureaucracy” to an already burdened program. “I believe it is a good-governance bill,” Allen said in defense of the measure, adding that it would create “transparency” and “accountability”. Allen also said she is willing to amend language that may seem too vague in order to appease Democratic legislators who oppose any expansion of the ESA program. After nearly three hours of testimony, the committee approved the bill along party lines, with Republicans supporting it. Democratic legislators said they wished the constituents in the audience and other lawmakers would give Hoffman time to examine the program with the new task-force instead of using the law to implement fixes for what they said is a policy issue. Additionally, many of the Democratic lawmakers said they were opposed to the measure as it contained very similar language to Proposition 305, which would have dramatically expanded ESAs and was rejected by a 2-to-1 margin in November. The bill is similarly opposed with more than 800 people stating online that they oppose it. “I am representing the will of my constituents,” Sen. Sean Bowie, D-Phoenix, said in explaining his vote against SB 1395. Mesnard said he hopes Allen implements the changes in the language to make it seem like less of an expansion to the ESA program so his Democratic colleagues would vote yes, though Mesnard added that he did not believe the bill was an expansion. This is just one more example of the arrogance of our legislature. “You may know what you want, but we know better”. Probably time for another initiative. Not ALL people in yellow shirts were supporting these bills. Save Our Schools Arizona had their yellow shirts first, as a vibrant call to for voters to reject proposition 305, which they did by a two to one margin. I proudly wore my vibrant yellow No on Prop 305 shirt to the hearing to remind our lawmakers of the voters’ position on vouchers. There were at least four others in our vibrant yellow shirts just in my immediate vicinity. I have gone back and forth with the Senate President Karen Fann on this. She is our District 1 Senator and someone I have known and respected for many years. She has explained that there were some housekeeping types of matters that this bill is supposed to clean up to which I responded then how come there is voucher expansion as part of the bill? Moreover, on the Request To Speak (RTS), the opponents out numbered the proponents 5 – 1. I advised Sen Fann to expect another initiative if this passes against the will of the people. To all that read this: Please write your Senator and express your views, whatever they may be. The following is a copy of an email I sent to Michelle Ugenti: As a resident of your district I am writing to express my opposition to SB 1395. It is little more than another bad plan to remove more funding from public schools. Additionally, it privatizes the ESA program and removes it from Department of Education oversight. Both of which are very bad ideas. Privatization of any traditionally public institution in America is a manipulation designed to create private income streams with no accountability to the public. Ultimately it is designed to create two classes of people: Wealthy people who can afford to send their children to very good private schools and people who are not wealthy who are forced to send their children to schools that don’t have the funding needed to provide children with a good education. I am vehemently opposed to SB 1395 and I request that you vote against it.